This is one of those recipes where exact measurements aren't that important. Just adjust to suit your own taste. Place ingredients in food processor pulse to mix. 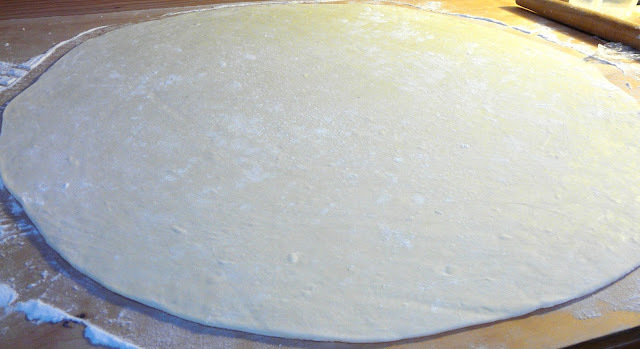 Add a little water and process until dough comes together. Should be a soft dough, but not sticky. Wrap in plastic and let rest for at least 30 minutes. Saute the onions in butter until golden. Add onions to mashed potatoes. Mix in the cheese and season with salt and pepper. Make sure the potatoes are hot so that the cheese melts. 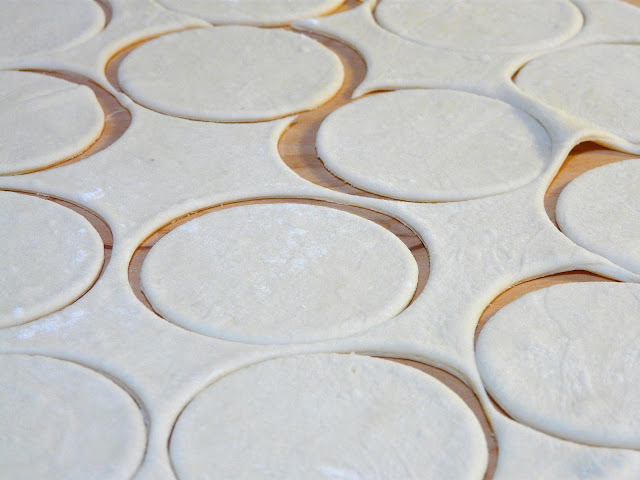 Roll the dough out and use a 2 or 3 inch biscuit cutter to cut the rounds. Gather up the scrapes and reroll. 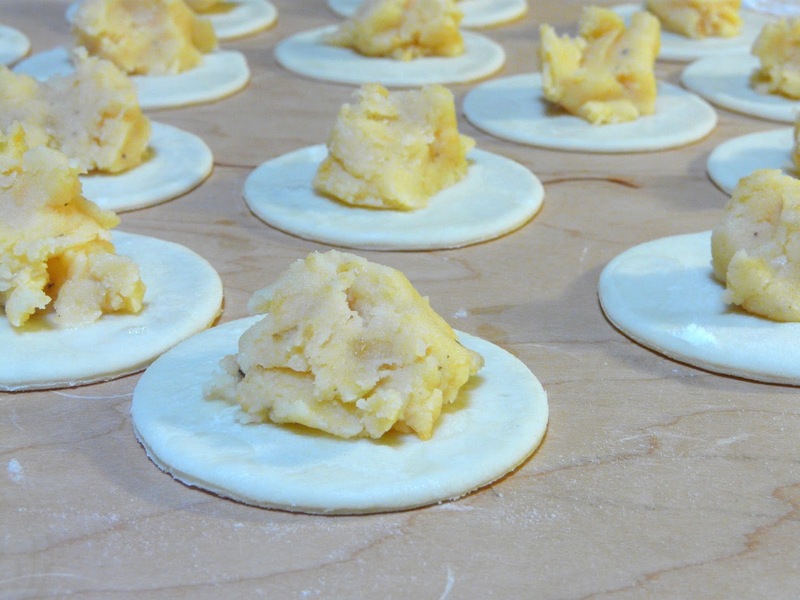 Brush the edges of the dough with a bit of beaten egg white, add a teaspoon or so of potato cheese filling and seal. Use a fork to seal the edges. I put them on cookie sheets lined with parchment and freeze. Once frozen place in freezer containers. To cook, just bring a pot of water, seasoned with salt to a boil and simmer the perogies until they float. Only takes a few minutes to cook. 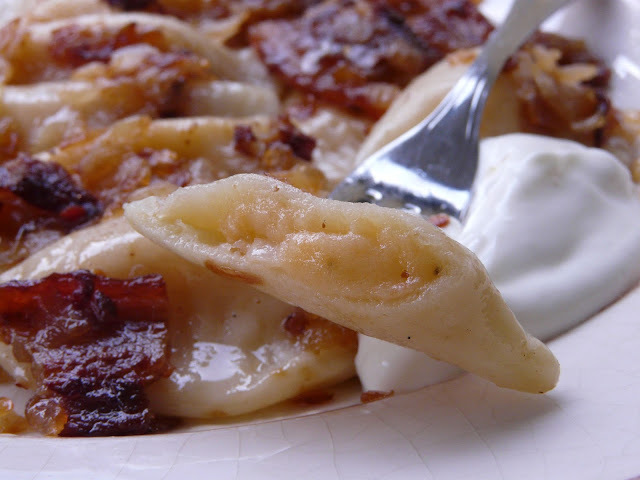 Toss the cooked perogies with some fried onions and bacon or side pork (pork belly) and serve with sour cream. I've never made perogies before... I've always bought frozen ones. This doesn't look too difficult, but extremely tasty! 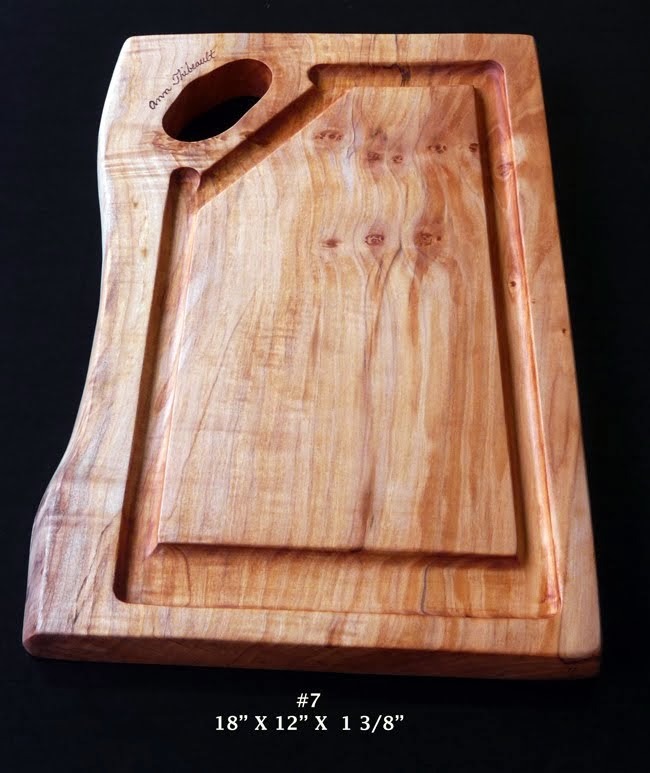 I'd love to try my hand at making them, though I'm sure mine would never come out looking as perfect as yours!! Now dear Ann, this is yet another recipe you taught me how to make. I had never made them until you showed us a while back ~ you made me surprise myself!! An excellent recipe with very clear directions, and after I tasted them I'll never go back to 'store bought'. They are the best I've ever tasted. Glossy Cookbook Perfect photos, as always. 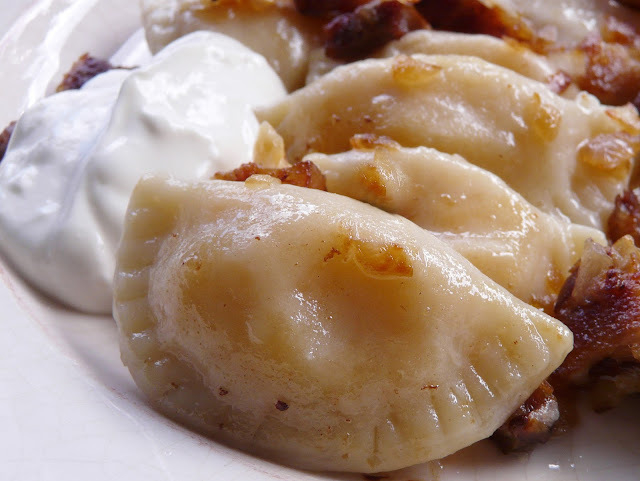 Ann, my son has always enjoyed perogies, so I've been making them ever since you taught us. Your instructions make it very easy. These are beautiful! I can't remember the last time I even ate perogies. I am very inspired to try these, because they look delicious! Love your blog, love your photos. Sounds delicious! Pierogies are a favorite of mine. These look sooooo good! We occassionally go for perogies at the local Ukranian Church. The lineup can be hours long. I'm going to try to make my own. Thanks for sharing the recipe! 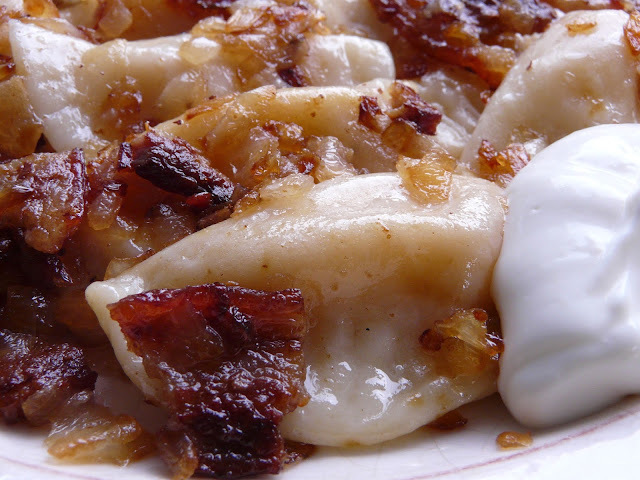 I love perogies and make them at home all the time. I would suggest you invest in a Hunky Bill's Perogie maker. 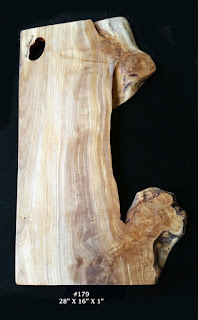 They are made in Manitoba, Canada and I think they can be bought online. 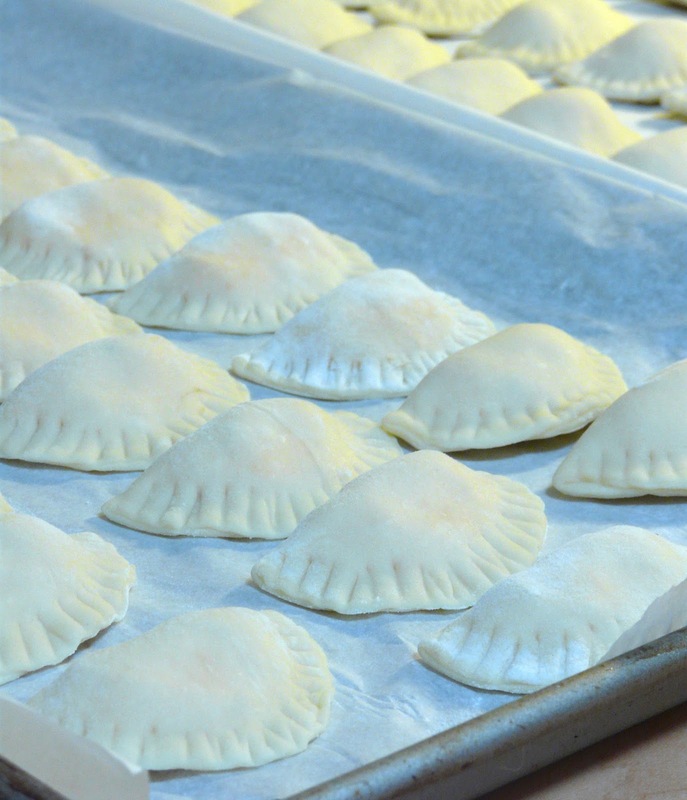 It takes heaps of the work out of perogies and they are all perfect! 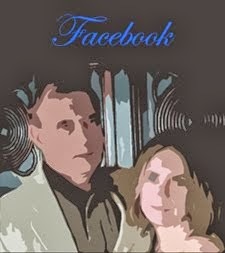 Thanks for commenting Carm. And thanks for the suggestion. I'm sure that the perogie maker works great and is a time saver. But I actually enjoy the process of making perogies by hand. 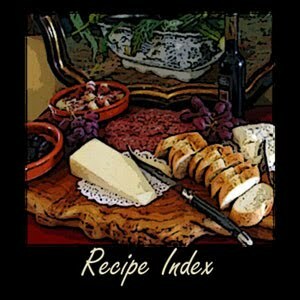 I love this recipe and can not wait to try it, I was just wondering though, what can I use if I don't have a food processor? Kayla, you can knead the dough by hand. Or if you have a Kitchenaid or other stand mixer you can use it. we grew up on these but my mother would cook saurkraut with onions until it cooked down and was no longer sour. boil, drain and smoother in buter! so good! just made them last week! I used to have your recipe bookmarked on my foodgawker account and have been trying to find it for a few weeks now. 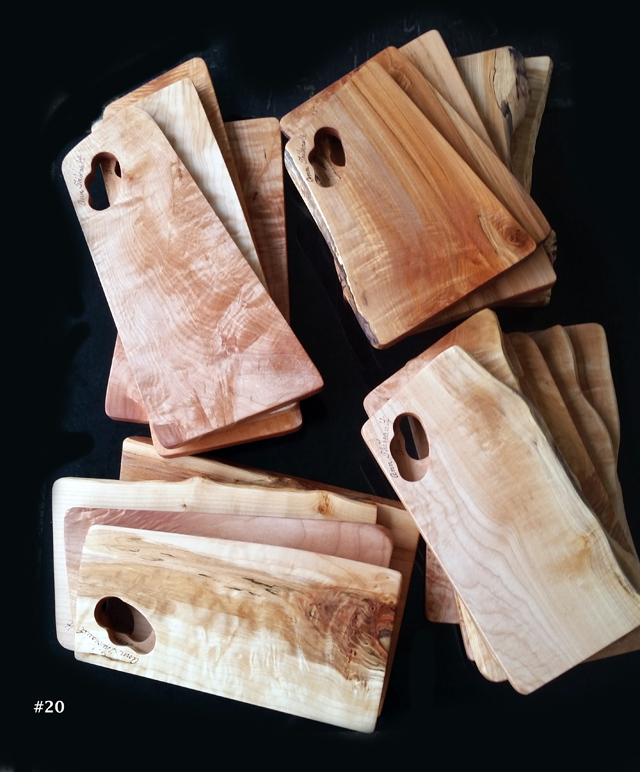 Thank gosh I remembered you had cutting boards for sale too as combining it in my search term on google helped me find you again. PHEW i can finally satisfy my pierogi craving. Alyssa, I'm glad you found what you were looking for. Someone else made my perogies today and now I have a craving. Might have to make a batch this week.